Founded in year 2005 by the textile technocrats who are well known in the textile spinning industry for their marketing activities associated with leading brands of textile machinery and accessories. 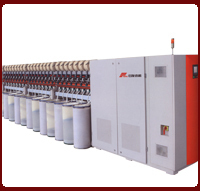 JAAZ was largely instrumental in establishing the Chinese textile machinery in India. Over the years , jaaz has made its mark as a company committed to bring appropriate , reliable technology in the spinning industry and have started associating with the world class manufacturers in the field of machinery and accessories..JAAZ is supported by the team of professionals with the experience and expertise to meet any customer’s requirement with innovative solutions. Today JAAZ is fully equipped to respond any requirements in terms of textile machinery and accessories across the line from Ginning, Spinning, weaving, processing, Air engineering, Auto mation and Non woven segments.etc., In the year 2008 ,Jaaz has entered in to the field of electronics by starting sister company "Jaaz Electro Drive Systems", and started doing stock and sales of world class "TECORP, Inverter, HMI, PLCs, Servo Systems. Thanks to the dedicated after sales service, today JAAZ has become one of the trusted names in the textile& inveter business.